A project to restore and reopen a historic Glasgow municipal bath house has been given initial support by the Heritage Lottery Fund (HLF). Govanhill Baths, which closed in 2001 despite a local campaign to save it, reopened in 2013 as a community hub. It is run by Govanhill Baths Community Trust, which hopes to use the £1.2m HLF grant to reopen two pools, a Turkish suite, theatre venue and an arts space. The baths is among six Scots projects named in the latest round of grants. 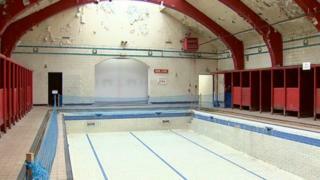 Alan Walsh, from the Govanhill Baths Community Trust, said the £1.2m would kick-start the long-term restoration project. "Fundamentally, this will allow us to fix the roof and we will be watertight," he said. "We will, potentially, be able to restore the toddler's pool, learning pool and ladies pool and do up the area through the back which is known as the steamie. Mr Walsh added: "That [the steamie] could be a multi-purpose use area such as a theatre venue, farmer's market and many other ideas." The City Observatory on Calton Hill in Edinburgh, which has been awarded £1.3m to allow the facility to freely open to the public for the first time in its history. The Inverness Townscape Heritage Initiative, which will see some of the city's oldest streets revitalised, will be granted almost £1.5m. A grant of £930,000 will go towards turning Kirkcudbright Town Hall into a new art gallery celebrating the town's artistic heritage. The former Davidson Hospital will re-establish its place at the heart of the Girvan community as a new enterprise centre thanks to a £1.39m grant. The Fife Pilgrim Way has been earmarked for £460,000 to create a long-distance walking route from Culross/North Queensferry to St Andrews. Dame Seona Reid, chair of HLF's Scotland Committee, said: "Research shows that investing in heritage can make people happier about where they live, and enhance their sense of identity. "Towns and communities across Scotland are realising that far from being a dead hand on development and regeneration, heritage can be the catalyst that encourages both."